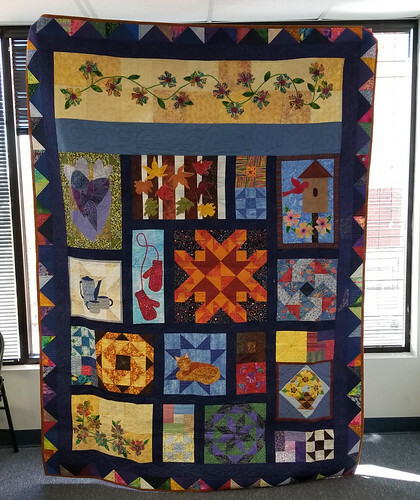 Quilts are starting to arrive at the office in Wilmington for the Carolina Hurricane Quilt Project, a few per week. Throughout this post will be pictures of some of the arrivals in the past month. The first post with all the details is still linked to the button on the sidebar, and you can click HERE to see the original post with all the FAQs and details. And read on for another heart warming story. The next run from both the Raleigh area and Western NC areas will be mid-February to take what we have to Wilmington. If you have a quilt delivered to one of those shops, we’ll get it soon. The next run after that for those areas and the Charlotte area will be in April. Again, our project will go to August, so you still have time. 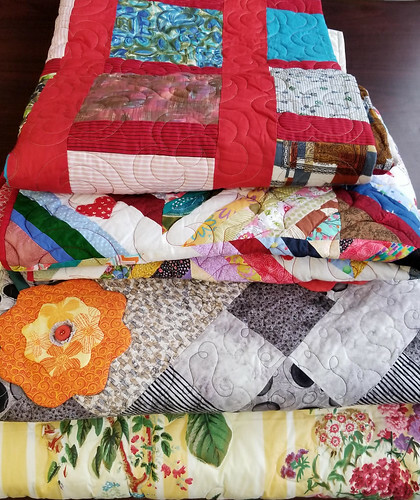 For the shops in Washington and Fayetteville, the next run will be determined by the number of quilts received. The runners will wait until there are at least a dozen or so to make the run. 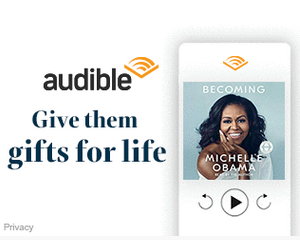 So, the sooner you can get yours to the drop points, the better. 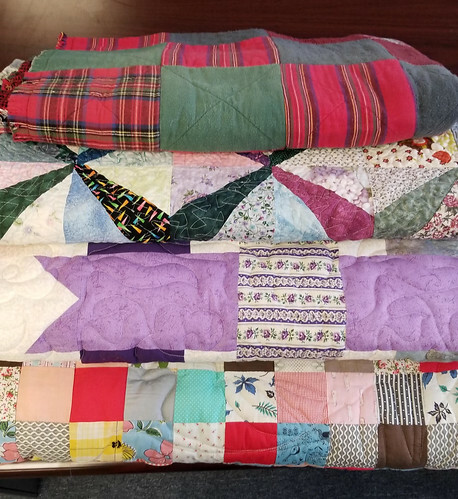 These quilts were picked up in Fayetteville by runner Sallie and delivered to Wilmington. Thank you to all the wonderful shop owners and staff, and our runner volunteers for their help with this project. These are drop off points only, not for shipping. 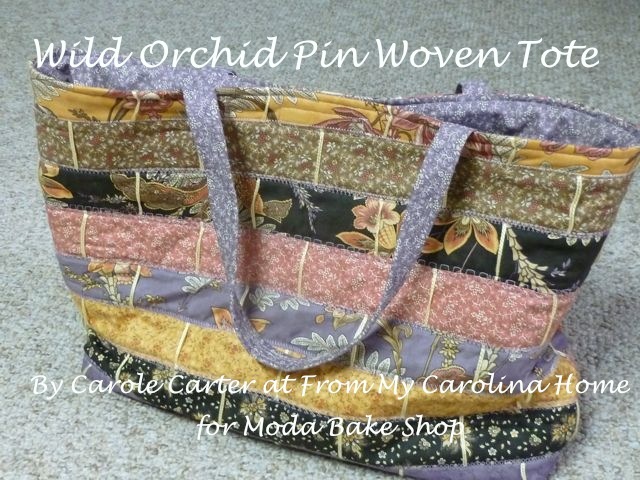 You can take your finished quilts to any of these North Carolina locations from now through August 2019. 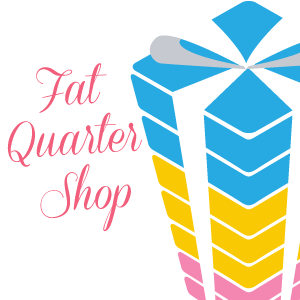 If you drop off a completed quilt at one of these shops, please pin a card to it to show it is for the project to reduce confusion and make sure our runners pick up the correct quilts. We need larger size quilts, preferably twin or bigger. At least 60×80 is best, and larger is appreciated. We really cannot use crib or baby quilts as each household can only get one quilt. 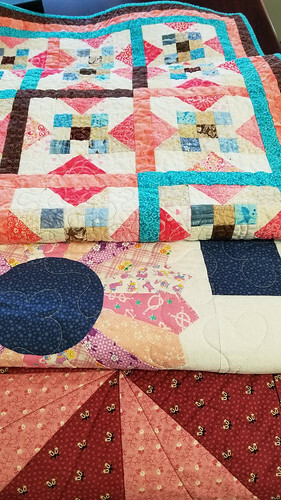 If you have a bed size top and backing that you cannot get quilted by anyone you know, please fill out the Quilter Needs Longarm Services form. 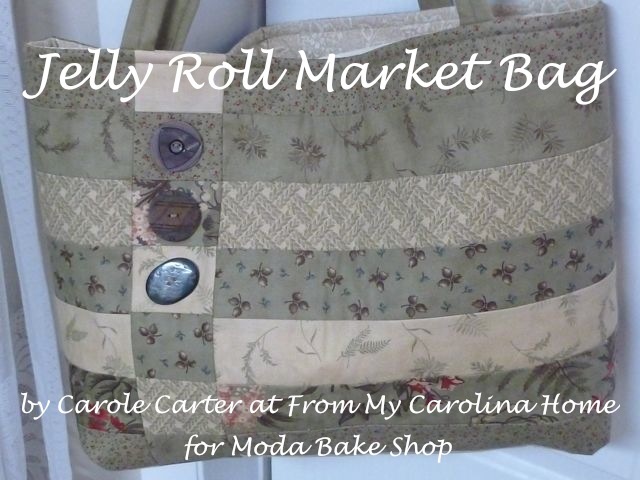 If you are a longarm quilter willing to quilt, bind and ship to Wilmington, (and I still need more!!) please fill out the Longarm Volunteer Form. 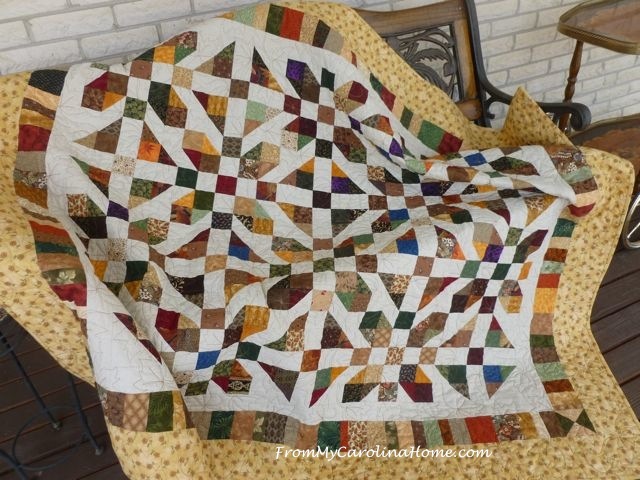 I am certain that the publicity with the Hands2Help challenge in March will bring more tops that will need quilting. Filling out these forms makes sure that I have the information needed to match quilters with longarmers that are as close as possible, and that they have the machine size needed. I will get back to you via email with your match. 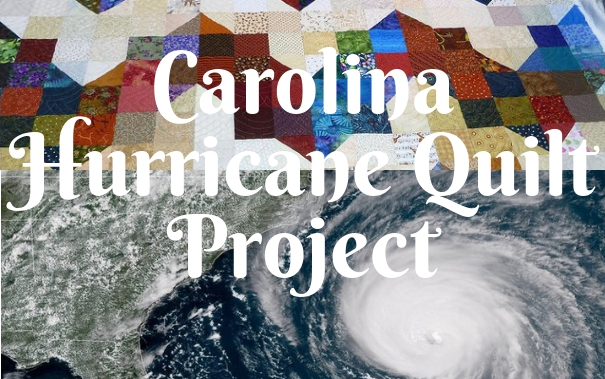 I particularly would like to have more longarm quilters in North Carolina who can finish quilts and deliver to the drop off points helping our home state. Ready for another story? This is a picture of Disaster Caseworker, Daniela and her client Tim. Tim was living the transient life before Hurricane Florence came to the Cape Fear. He had just secured some housing the week before the storm, but Florence didn’t let him keep it. Not only did the storm damage his housing, but his roommates stole what possessions he couldn’t pack with him. Once again living on the streets, Tim began searching for new housing. Now, roughly 4 months post-storm, he’s found a place to stay that he can afford. 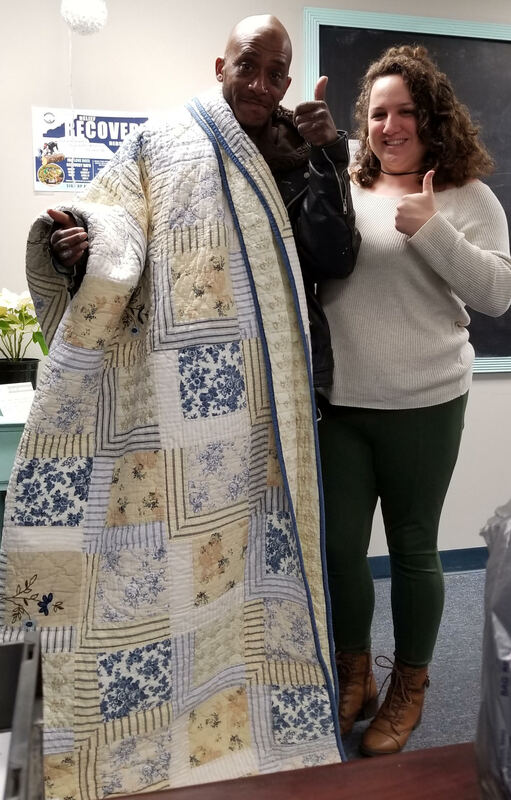 He came here hoping for a bed and left with a bed, pillows, sheets, and a quilt he can use for years to come. Once again for future reference, the first post is still linked to the button on the sidebar with all the FAQs and details. If you are on a smart phone, the sidebar info is at the bottom past the comments. Jo-El tells me that they have received 64 total (8 King, 9 Queen, 18 Full, 29 Twin/Throws) so far. With 4500 homes destroyed, we need a lot more. You can make a difference in a life! Thank you all for your help with this project! 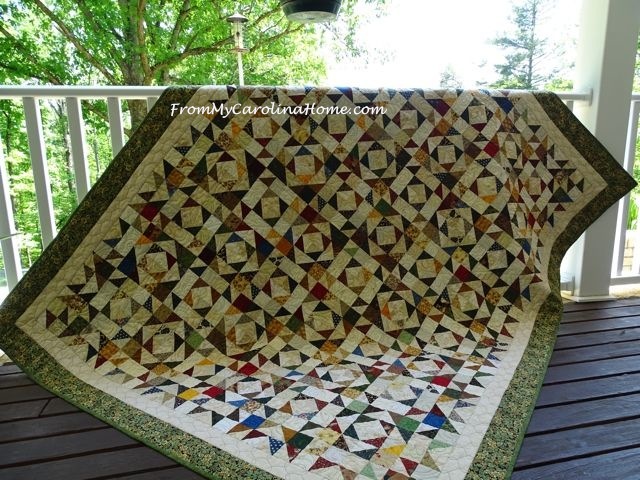 You can see the next update on this post – Quilting With An Oops! I know at least 10 quilts are coming from the Asheville Quilt Guild, but those are just the ones I know about. There could be more. Thank you for the update. I reposted to Facebook. 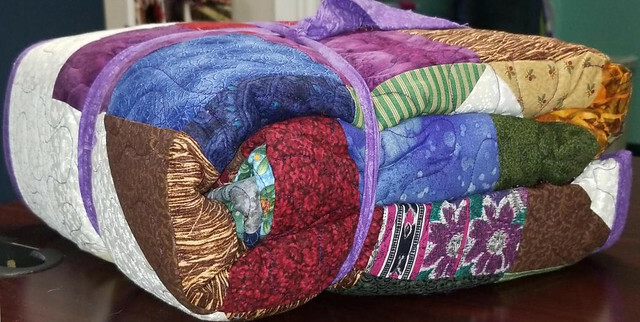 Great to see the pile of quilt ready to be donated. 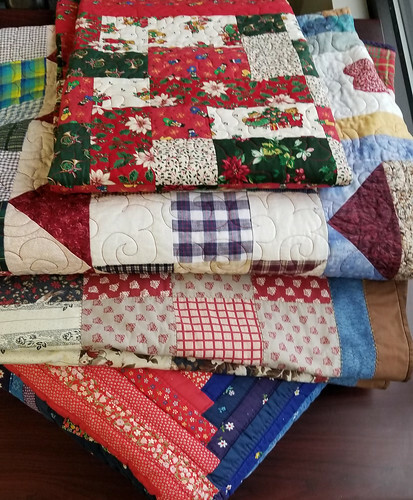 Hello Carole, It is amazing (in a wonderful way) to see all of the quilts stacked up and ready to be delivered and then start being given out to those who need them. I am also glad that it will all being continuing until August. The personal information given about Tim and his struggles really hit my heart and I am glad that you included this. 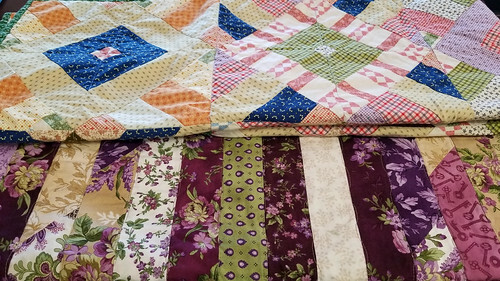 Although, we all are making the quilts to help our fellow Americans who have lost everything in so many instances, it somehow makes the process that much more important when we see, hear and read the true benefits. I am sorry if it is not coming out the way it should, yet, I am sure you know what I am trying to say, Carole. Want a great big surprise? We are going to be moving to South Carolina very soon! Have a great day! Thank you for the update – still a long way to go. I was excited to see your project on the H2H page! That will get some help. At the moment, I have three out to my friend for quilting, and I am planning on making at least three more. I will need a quilter for one of them, and I’ll fill out the form when it’s done and I know the size. 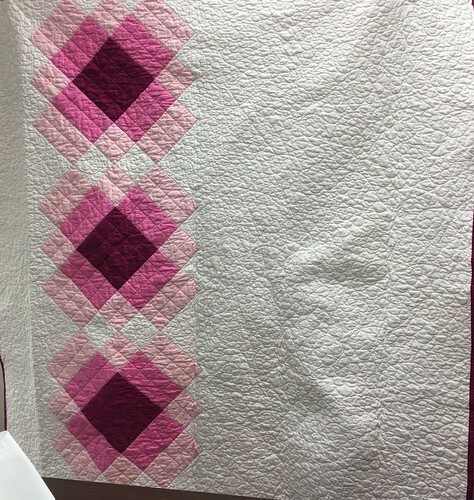 I will send back and batt with it, so the quilter just has to quilt and bind. Another friend sent one to Wilmington directly, and will have two more. 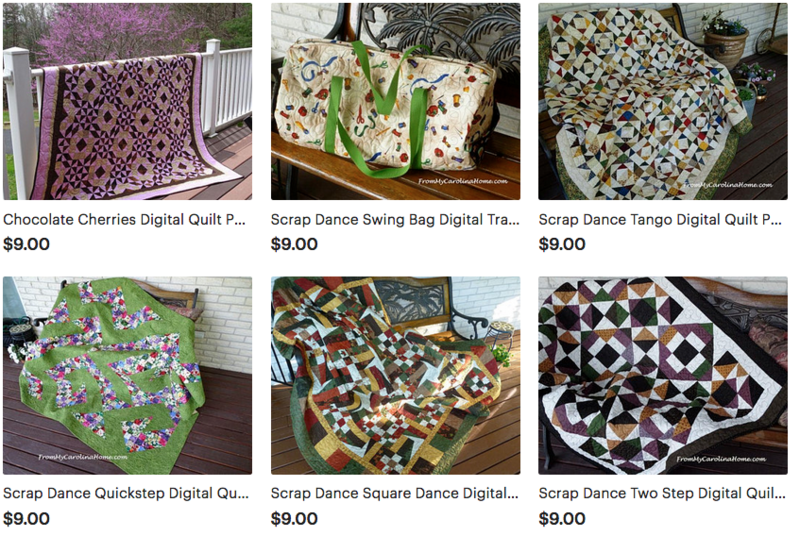 This has been great for helping people who have quilts they would like to donate somewhere! Great to see the progress and all the quilts. A lovely story. what a wonderful think you are doing!! The support for this project is impressive. Thank you for the update and to everyone working to coordinate this effort!